News Archives - Welcome Home! Want to get to know our staff? Well, here are some of them! Meet Menchie, Rheinne, and Keith! We decided to get together under one roof, and voila! It happened! Here are some photos from our year end get together at the Legend Villas. Watch as LeadNet partners say thanks to our clients! Truly, we live and breathe our culture of “attitude of gratitude” everyday. 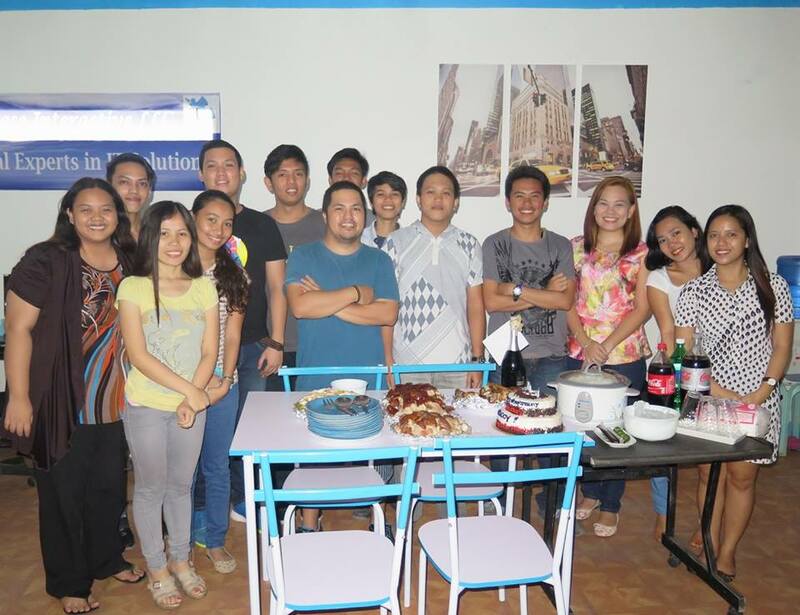 Showered with numerous blessings this year, Logicbase Interactive is able to partner with Leadership Network, our second partner from Makati City, Manila, Philippines that took place last May 29, 2015. And just this month, Leadership Network’s HR and Recruitment Manager, Ms. Gem Manalansang visited Logicbase Interactive’s ground in Cagayan de Oro City, Friday, August 7, 2015. As her arrival was also a perfect timing of our Social Media Director a.k.a. the cool guy in LBI, Sir Coy’s Birthday Bash, the welcome revelry and birthday celebration became a big blast of joint merriment. All were having fun with picture taking and the mouth-watering foods being prepared. To give you an idea about our new partner company, Leadership Network is a group of ventures that diversified from a single service last 2013. LeadNet originally started providing training and process improvement solutions for Small and Medium-Sized Businesses, as well as the public sector. They aim to provide opportunities to Filipinos without having to leave their hometowns or even their own homes. To seal the partnership with credibility, professionalism and healthy business relation, the LBI team decided to make Ms. Gem feel comfortable through exchanging and sharing of experiences, interests, future plans and other business matters needed to be discussed during the first meet up. The bond we established during the encounter was actually filled with delight and get-to-know stuff. Aside from the event we celebrated during lunch break, we also relish the day with a night out with varied destinations. After we fetch Ms. Gem from Mallberry Suites Business Hotel, we directly went to Lefty’s Chick-N-Chops for a light dinner tasting their best seller foods such as their huge delicious Cheese Burgers (they also serve spicy burgers), Spicy Korean Buffalo Wings, Fries and Brownie ala Mode. Right after the eating session, the next stop was we shook our body off dancing like there’s no tomorrow via dance machine and singing like a superstar at Songhits Family KTV just located on the same building above Lefty’s Chick-N-Chops at Great Spot Arcade, J.R. Borja Extension, Cagayan de Oro. Although the night was getting deeper, the shared connection didn’t just stop there. Together with the LBI team composed of the LBI Admins (Sir Bryan, Ms. Yani, and Ms. MJ), Acadeo Team (Ms. KC), two Virtual Assistants working for LeadNet clients, Paolo and Nikki, and lastly, Ms. Gem enthusiastically dashed to Mango Mania Healthy Dessert at Lifestyle District having a great night tasting their best-selling Mango Ice Cream, Mixed Fruit Ice Cream and Mango Mochi. It was a sweet blissful night indeed! With all the random thoughts, Ms. Gem’s pieces of advice for VA’s, uncontrollable laughters, discovered talents, and good foods, the day went to be just perfect as it can be. Cheers for the successful meetup! May we meet again Ms. Gem and the whole LeadNet Team. Thank you for visiting us! “We envision to have at least 1 near-home office (NHO) in each of all the provinces of the Philippines by 2020. This way, we will be able to extend the services we provide to our countrymen, by way of making employment possible without having to go to Metro Manila,” are the words from founder and Chief of Corporate Services – EJ Nolasco. And yet, LeadNet stays true to its word. With the influx of clients from the US and New Zealand, LeadNet, after establishing presence in Makati City and Cebu City, now makes itself present in one of the most progressive cities in the Philippines – Cagayan de Oro City. The office marks LeadNet’s first presence in Mindanao. “We are always looking forward to establishing presence in, what EJ and I believes, to be one of the most underutilized workforce, but definitely one of the most talented ones, in the Philippines,” said Jenny Santos-Nolasco. LeadNet has inked an agreement with LogicBase Interactive, a local venture headed by Bryan King. 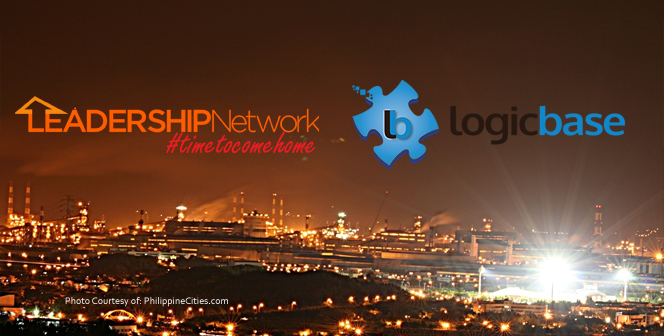 With the agreement, LeadNet will have presence in Cagayan de Oro, and will be able to deploy onsite staff utilizing LogicBase’s local reach and influence, technical expertise, and infrastructure. “As much as possible, we would like to grow the business with like-minded individuals. We are not here to compete. We are here with a clear calling: to bring the opportunities – if not directly at every Filipino’s home – near every Filipino’s homes,” said EJ. LeadNet is looking at establishing more presence in Davao City by 2016. It is also currently looking at establishing its National Command Centre at Calamba City by early 2016. To date, LeadNet, through MOSS, is looking at expanding its clientele to possibly employ close to 200 staff around the country by mid 2016. 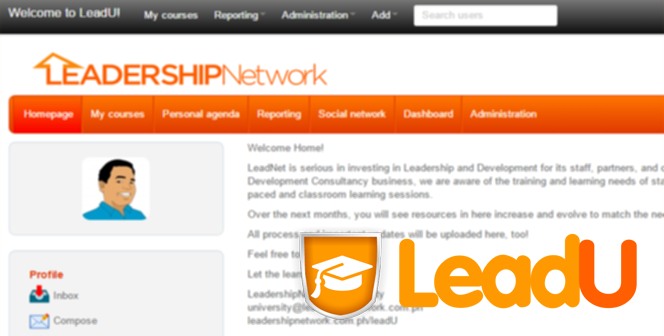 LeadershipNetwork has recently launched an online Learning Management System (LMS) called LeadU Online. The system will manage online content and appointment setting for online, live, canned, and onsite training sessions. LeadershipNetwork University (LeadU), headed and managed by seasoned HR and Training professional Gem Manalansang, targets to launch 1-2 new courses every week to achieve its year-end goal of reaching 60-70 new training content by year-end. LeadU will release both premium and free-to-access content for both LeadNet staff and the general public. “We are part of the community, so we want to make sure we do our part in improving the skills of all Filipinos who want to build careers in the BPO industry, and establishing a telecommuting career in particular,” says EJ Nolasco, LeadNet’s Chief of Corporate Services. Jenny Santos-Nolasco, LeadNet’s Chief of Corporate Operations, mentioned that the content generated by LeadU will surely “complement the needs of our clients in the Micro-Outsourcing” arm of the business. “We are very much looking forward to providing exclusive training content for our staff. I believe LeadU will be releasing certificates for each of the training sessions the staff will be taking so they can use these to bring more value to their personal portfolio,” Jenny said in an interview. Access to the LMS is free for all. 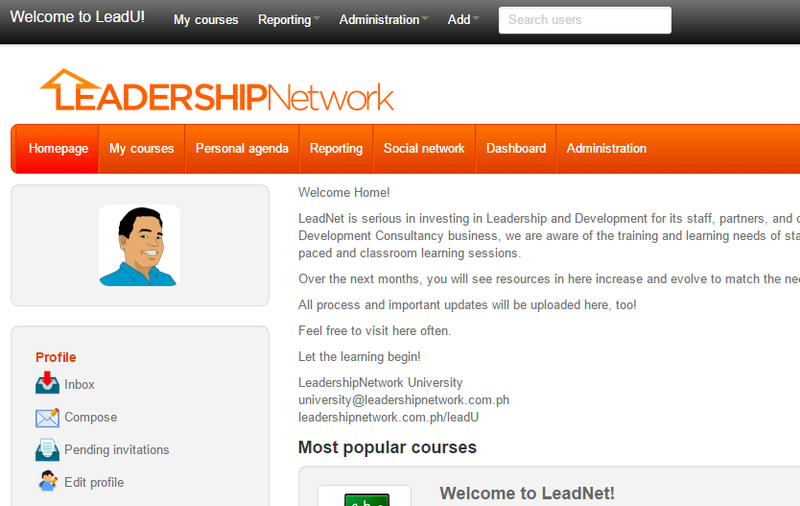 Everyone is invited to submit a request through the LeadU online portal (leadershipnetwork.com.ph/leadu). All requests are returned within 2 business days. Best Practices in Corporate Revenue Accounts and Audit Review. 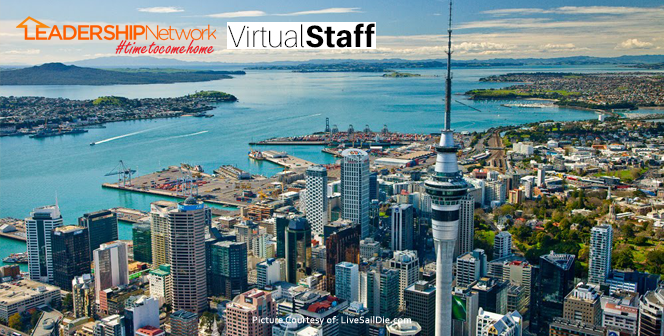 The Leadership Network (LeadNet) has entered into an agreement with New Zealand’s Virtual Recruitment (Virtual Staff) which could very well open up a lot of work-from-home employment opportunities in the next 18 months. LeadNet, while still relatively new to the telecommuting industry, has nevertheless grown by leaps and bounds since its inception. The company currently hires a roster of extremely talented and dedicated individuals that provide virtual support to several businesses in Australia, New Zealand and the US, with other potential markets opening soon. Virtual Recruitment Ltd, meanwhile, is headed by Stephen Martin. He has extensive business reach and connections across New Zealand. The agreement was spearheaded by Martin and LeadNet Chief Executive Jenny Santos-Nolasco under Leadnet’s MOSNet Division. Because of this arrangement, MOSNet, via Virtual Staff, will start having a local presence in NZ. Virtual Staff will have exclusive rights to resell all of its Remote Administrative Assistance, Marketing, Online and Technical services at the Shaky Isles. Currently, MOSNet provides Virtual Assistance services. These new developments will not only repackage its existing VA service packages. It also catapults MOSNet to become a full offshore services provider in the country and opens up opportunities for expansion in neighboring Australia. Client relations will be managed by Virtual Staff, but with all operational processes remaining in the Philippines, LeadNet is looking to employ between 100 and 250 new people within the next 12 to 18 months alone. LeadNet remains focused on the diversification of its services. The aim is to become a full services provider that can support MOSNet’s growth. The company will also be launching LeadU in November 2014 to provide training and leadership development to all potential hires. This is to ensure the good quality is delivered amidst the rapid ramp up. The agreement started December 2014.